Boulder, CO • May 9, 2017—For the twelfth consecutive year, small and independent brewers across all 50 states will be participating in American Craft Beer Week (ACBW), May 15-21. In the spirit of America’s craft beer culture, camaraderie and collaboration, beer lovers everywhere are encouraged to #beeritforward and share a craft beer. Presented by CraftBeer.com—the beer lover site published by the Brewers Association—American Craft Beer Week celebrates America’s 5,300 small and independent brewers through a host of events encouraging beer enthusiasts everywhere to engage in simple acts of craft beer kindness. 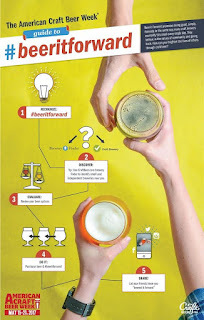 For help in choosing the right craft beer to share, visit CraftBeer.com’s Guide to Sharing.